Valerie Ghent (above in white shirt) formed Feel the Music, a nonprofit organization that shares music with children who have been through trauma. It’s hard to believe that 9/11 happened 15 years ago, but I remember it like it was yesterday, because out of that tragic time something beautiful was born. Fifteen years ago, I was riding my bike along the West Side Highway from Ground Zero when an idea came to me. It had been a long, grueling day. All the days had been like this. They all merged together, hour after hour, day after day, the same sights, the same soul-chilling experiences, my eyes taking in destruction. I couldn’t remember much but pedaling, one foot after the other, and the whir of my wheels. The night air felt good and refreshing. The bike path was empty this late. The Hudson River reflected the lights of Jersey City in shimmering water. I saw a barge taking away steel that had been cut away from the WTC site. Just as I passed Pier 25, it hit me. How could we bring music lessons and instruments to children who lost family on 9/11? Knowing first-hand the powerful role of music in my life and those of my fellow touring musicians, and seeing how music had already been so important in bringing people together since the disaster, the idea resonated over and over in my mind like a song. I live in Lower Manhattan below 14th Street, where in the weeks after 9/11 you had to show ID to get through. Our tour in Japan had been cancelled. Concerts in L.A., recording sessions for upcoming albums – all cancelled. I had been mid-album with Ashford & Simpson and Nina Simone – all sessions had been postponed. And so I began volunteering in any way I could, first on my own, later with the grassroots organization WTC Ground Zero Relief. The idea of music lessons and instruments was but a seed. I wrote it down. I started talking with fellow musicians Bashiri Johnson (see his article at right), Arturo O’Farrill and Bar Scott. I spoke with 9/11 family members and with academics. I began to confirm what I already knew in my heart to be true, that music heals in ways we do not yet even begin to understand. Singing, playing instruments and writing songs all change us from the inside out. Making music impacts us physiologically, emotionally and spiritually. We already know that music is an outlet for creative self-expression, yet we also know music inherently creates community. Eventually, I learned that grants were being offered by the Red Cross. 9/11 family groups encouraged me to develop my musical idea. I approached the NYU Postdoctoral Program in Psychotherapy and Psychoanalysis, which formed a committee to advise and train my team. I found a fiscal sponsor. I drafted proposals. I kept writing and rewriting, honing and clarifying, all while sitting in airports, waiting for sound checks, on trains – everywhere. Three years after that late-night bike ride, our organization Feel the Music was born. We were awarded a $250,000 grant from the American Red Cross to launch our music programs. I had never written a grant proposal before in my life, yet look what happened. Feel the Music launched to great success in the fall of 2005. We served hundreds of families and recovery workers with weekly Saturday music and art classes, lessons, concerts, recording sessions and special events all over the area, including at public schools. Our hands-on workshops were designed to encourage active participation in music and the arts, to provide a space for creative self-expression, and to create community. People kept coming back, and the program grew. Our grant was renewed and renewed again. In 2008, we incorporated as a nonprofit organization. Feel the Music began a new chapter when it started bringing our music and arts programs to hospitals, senior centers and community centers, while still working with 9/11 families. 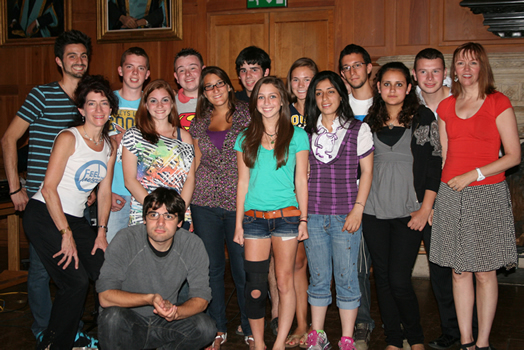 In 2010 in Belfast, we created a choir with international teens who had been impacted by terrorism. In 2011, we offered a large-scale public arts project with the Battery Conservancy and Tribute Center, which was covered by international news and TV. Today, Feel the Music serves Columbia Presbyterian Children’s Cancer Center, VISIONS Center for the Blind, Lenox Hill Neighborhood House, Project Find, Bailey’s Café and more. We continue our beloved annual Feel the Music summer arts retreat for 9/11 families. I am deeply moved that children who began with us have found mentors in their Feel the Music teachers, and many are now pursuing careers in music performance, music therapy or art therapy as a way to share and give back. In the fall of 2013 I was invited to a FEMA meeting at White House to discuss the role of the arts in disaster recovery, and to be a panelist on a nationwide FEMA call for disaster relief/recovery workers across the country. Music heals. Of that there is no doubt. Just yesterday I heard a woman say, “Since my son died, I’ve sung my way through.” We need more music and art in our lives, in our children’s lives, in our elders’ lives. I invite all Local 802 musicians to learn more about Feel the Music and our programs. As my own music career takes me around the world, I find increasing resonance with our work. Music is our collective heartbeat, a universal key to our soul, connecting us as people and reminding us of our shared humanity through rhythm and song. Let us all feel the music together. Visit us at www.FeeltheMusic.org. Valerie Ghent is a NYC vocalist, singer-songwriter, keyboardist/pianist and producer. She has been a member of Local 802 since 1990. Her fourth solo album “Velours” releases on Oct 21. See ValerieGhent.com. Members of Local 802 are welcome to submit personal essays to Allegro for consideration in our MEMBER TO MEMBER column. E-mail Allegro@Local802afm.org. Local 802 members Bashiri Johnson (with mallets at far left) and Valerie Ghent (far right) at a Feel the Music drumming workshop. I teach Rhythm Healing Drumming Workshops. On the surface, I instruct students in the basics of drumming and rhythm. My goal for each participant is to enable him or her to not be intimidated by the drum or rhythm and to feel comfortable with any hand drum instrument. This is achieved through teaching the basics of drum sounds, types, tones, techniques, rhythms, group playing and performance. I connect our drumming to song. I connect our drumming to history and folklore as well. 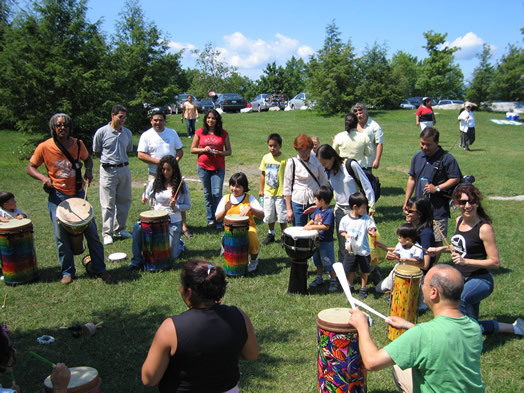 In this way students are empowered to accompany themselves or others in drumming and songs. I show students that whatever rhythms they can see and say, they can play. I have seen time and time again how a student of any age might express their inability to drum. Then after just one lesson, they engage, interact and enjoy the experience of drumming and playing rhythms. It’s been remarkable to watch. I also participate in visits to Columbia Children’s Cancer Center, where I engage, perform to, and interact with children in treatment. Feel The Music has sent me far and wide to share my Rhythm Healing workshops with children, teens, disabled, seniors and families. It’s been more than just a labor of love. For me it’s been therapy and blessing. All my fellow instructors are vetted and we all receive coaching in dealing with students impacted by trauma, loss and disability. This coaching and training has proved invaluable for me, not only in my workshops, but also in my day-to-day life. Resilience can be challenging to those who face some extreme difficulties. But the time, care, attention and support that we provide is helping to change lives for the better. I have seen it, heard it and felt it first hand. At present I’m giving drumming instruction to senior citizens. They’ve been truly enthusiastic and excited about drumming and rhythm. Our classes are a joyous occasion of fun, groove and community. For me Feel the Music has been, and will continue to be, a welcome excursion into sharing, supporting, giving back and empowering others. My journey has been as rewarding for me as it’s been for my students. Bashiri Johnson has been a member of Local 802 since 1977.